The intermediate move is one of the most refined tactical procedures. This maneuver comes in the form of a move which interrupts an apparently forced sequence of moves, improving the position of the player making the intermediate move. It often comes in the form of a counterstrike when a piece is being attacked. This next example shows you a classic example of an intermediate move. You may have been in a similar situation before. The black knight from b4 performs a double attack on the white rooks from a2 and d5. Now White is forced to give up one of his rooks in order to save the other one. Not quite! White has a little trick: 2. Rd8+, check, and now Black must protect his king 2... Kg7. This way the rook was moved away from danger and allowed the move of the other rook as well 3. Rb2 . 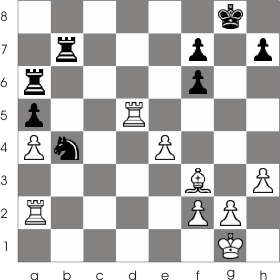 This way, using an intermediate move, White manages to save both of his rooks. 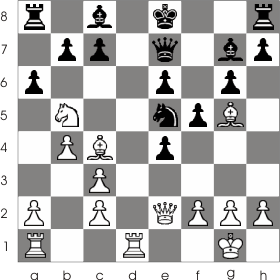 In the following game White attacked the queen from d7 so that when Black captures the bishop 1... Q:f5 the knight will attack at c7 both the king and the rook and thus capture the rook. But Black is able to make the intermediate move 1...Nf3+ so that when 2. g:f3 the black queen captures the bishop with check and, at the next move, captures the knight from b5 with the pawn from a6. 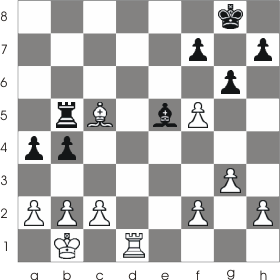 You can see in the example below that the white bishop from c5 is under the threat of being captured by the black rook. But before he defends it, White makes the intermediate move 1. Rd8+ Kg7 and with 2. Rd5 he defends the bishop and threatens 3.Bf8+ (a combination of a discovered and double attack followed by the capture of the black rook). Black gives up because after 2... Bd6 follows 3.Bd4+.